2. Search for the member with the incorrect/old email address that you would like to merge into the correct member record, and click Actions > View against their name within the members listing. 5. The pop up window will then automatically pre-fill the members data, enter the target email address of the record you want to merge with and click Merge User Records. The email address that is entered into the pop-up window is the email address that will remain for that member record. The target member record will maintain the contact details for the member, whilst all other information will be merged, this includes Financial information and data that has been stored in the member history. We would recommend always ensuring the target email address is the correct and up-to-date email so that the user is able to maintain their login information. 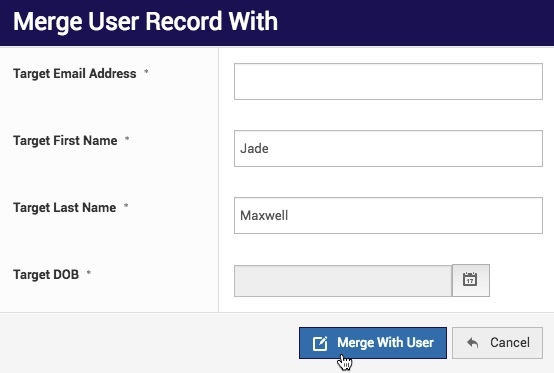 If merging a primary member account (with linked members) into another primary member account, the original linked members will reattach to the target primary member record. A secondary member record can also be merged into another secondary member record. Further to this, financial status is now verified when merging member records, therefore it no longer requires you to merge the unfinancial into the financial record. You can merge either way, and the system will verify whether there are any valid subscriptions against either of the member records and ensure the relevant financial status is maintained accordingly. Both member records must have the same First Name, Last Name and DOB to merge.